At night on March 5, an AH-1W helicopter, which belongs to the U.S. Marine Corps Futenma Air Station, failed in its landing on the deck of U.S.S. Denver during training off the east coast of Okinawa’s main island. The right skid of the helicopter collapsed. In the afternoon of March 6, U.S.S. Denver berthed at the pier at White Beach in Uruma City. The helicopter is still leaning to one side on the deck of the ship. 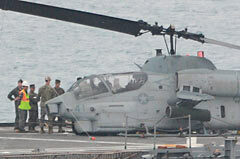 As of 4:30 p.m., March 6, the U.S. Marine Corps had not reported the accident. broke. The U.S. military said that a part called a “cross tube,” which is mounted above the skids, and a skid itself broke after the helicopter landed on the deck of the ship several times. There were no injuries to the crew. An official of the U.S. Marine Corps on Okinawa commented that the aircraft was still on the ship for investigation. It will be brought to the Futenma Base for repair and for further inspection on land. There is speculation that the helicopter may have landed on the sea, but the Marine Corps has given no detailed information. The Okinawa Prefectural Government asked the Okinawa Defense Bureau on March 7 to prevent a recurrence of accidents and to investigate the cause of this accident. At 1:00 p.m. on March 6, the 11th Regional Coast Guard Headquarters received information from a crisis-management officer in the Cabinet Secretariat that a U.S. military helicopter had failed in its landing on the ship, and had fallen into the sea off the coast near White Beach. The Coast Guard sent a patrol boat and a helicopter, but they could not see anything washed up or any oil leak at the scene. At 6:00 a.m. on March 6, local residents saw AH-1W helicopters from Futenma Air Station flying in formation over a residential area. Trouble involving U.S. military airplanes has occurred two days in a row. On March 4, a Kadena-based F-15 fighter lost its windshield.